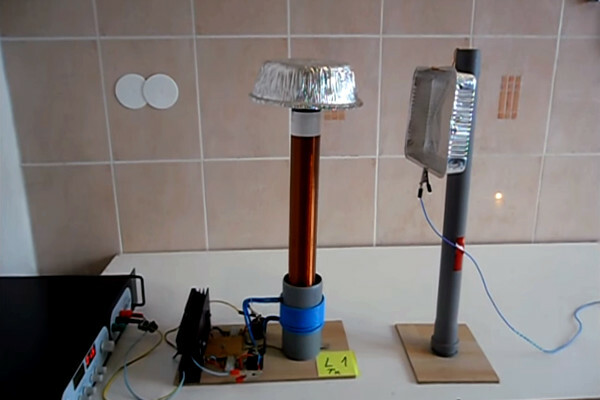 Tesla coil generates a high-frequency high voltages. This voltage creates a strong oscillating electric field in its surroundings and induces an alternating potential on the receiver plate ( electrostatic induction ). 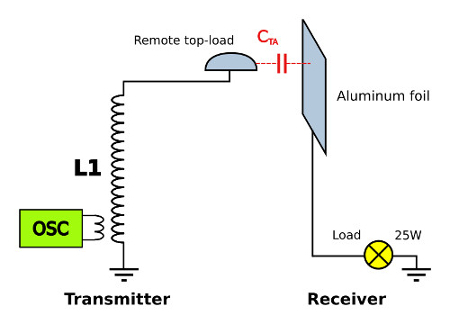 By changing the distance between L1 and aluminum plates, also changes the capacitance CTA + CLP, which significantly affect the wireless power transmission. 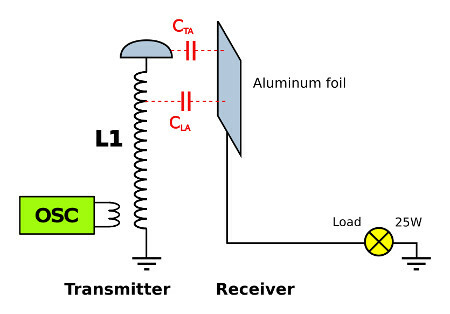 Since the coil away from the aluminum plate, capacity CLP between the coil and aluminum plates has almost no effect. It is also the inductive influence coils L1 fully eliminated. 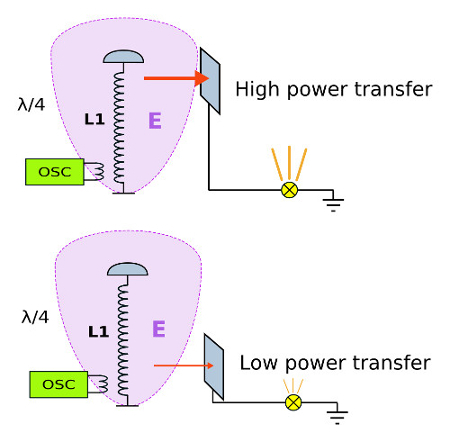 This and the previous experiment clearly shows that the wireless transmission of energy is fully implemented using capacitive coupling. Great work and site; extremely interesting experimental physics you are engaging in! I’m sure you are aware of the work of Prof./Dr. Konstantine Meyl. FYI, there are metal spheres available at reasonable cost found on Amazon, for example – search: “gazing globes.” The last time I purchased them I found that “strings of them – a bunch that hang from a tree, or whatever” were the same price as a single smaller sphere; just be careful they are metal (aluminum) as some are coated glass and what not. They’re good if your trying to create matched sets; TX – RX. I prefer aluminum but SS seems to work OK (the material is a whole science in itself – copper appeared lethal, seems to give off too many electrons (?) and they will bankrupt you). Thank you for the positive opinion about my work. I know the works of Prof./Dr. Konstantin Meyl and I consider them very interesting, especially as relates to the scalar waves. The idea about metal sphere seems to me very useful. Hola amigo, muy interesante experimento. Puede usted por favor describir la etapa de oscilación? The degree of oscillation? Please more detail in question.